This amazing growth was all in the first year. And it just kept getting better. Year two revenue surpassed year one, year three surpassed year two. I finally felt like I had “made it” as an entrepreneur and a business owner. Coming off a painful business failure – I needed these wins on so many levels. My growth was due in large part to how I filled my pipeline of new prospective clients. Let’s read that line again. My growth was due in large part to how I filled my pipeline of new prospective clients. 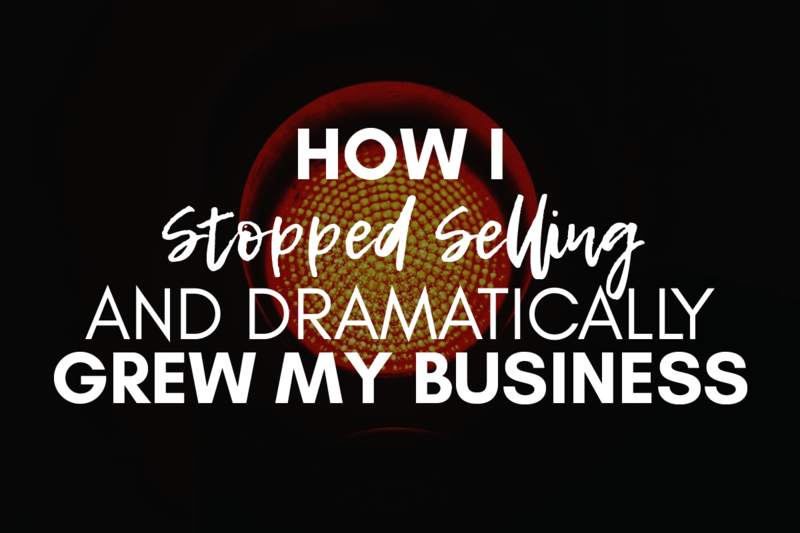 But it gets better – this growth came with an amazing benefit…it allowed me to stop selling, to stop being the hustling salesperson and to stop worrying about where my new clients would come from. A big difference between my first and second businesses was how I attracted or found new prospects, aka potential new clients. I discovered a process – 5 steps – that allowed me to generate referrals. My clients and Centers of Influence (COIs) became my advocates and started filling up my inbox with potential clients. Side Note: A COI is someone in your network who knows what you do, doesn’t do what you do (no competitive overlap), and comes in contact with your ideal client. I worked my 5 steps year after year and my referral sources referred me. But these referrals were received without asking for them… and that was key. I wanted a way to generate referrals that did NOT include asking for them. I was not then, nor am I now, willing to ask someone to refer me to someone they know. Period. Referrals are the holy grail, the golden egg, the single best way to grow your business. Generating new clients through referrals will save you time since you do not have to spend time cold-calling, networking, and prospecting. Generating new clients through referrals will make you more money because referred clients value you even before they meet you making them less cost sensitive. Generating new clients through referrals will allow you to be the problem solver for your clients, not the salesperson to your prospects. A distinction most business owners desire. As my business steadily grew from referrals, I noticed some pretty cool shifts taking place in how I did business. One big shift – I stopped selling. Be honest. That is music to your ears, right? You can stop selling and still increase revenue bringing in new clients. But before we get ahead of ourselves – even when you receive referrals, some facets of the traditional sales process still exist and are even more prevalent with relationship-based businesses. A relationship-based business is one where your prospective new clients still have to know, like and trust you to decide to work with you. The parts of the traditional sales process that you will do, even with a referred prospect, include the first meeting with the prospect and helping them through the buyer’s journey. The buyer’s journey picks up after they become aware of your business and moves them through making the decision to work with you, to hire you. Their decision-making process within the buyer’s journey runs parallel to your sales process as you move them to a yes (or no). When I say I was able to “stop selling,” I don’t mean I abandoned my entire sales process. The part I am referring to changing is the language I use through the sales process. I still meet with prospects but what I say to help them get to a yes changed dramatically with a referred prospect. Before we dive into the changes in language, let’s first look a little closer at the traditional sales approach so we can easily see how referred prospect sales language is different to non-referred prospects. According to the National Association of Sales Professionals, a sales process is a systematic approach involving a series of steps that enables a sales force to close more deals, increase margins and make more sales. This sales process exists or lives within the buyer’s journey. Conductor describes the buyer’s journey as the purchase process consumers advance through. Meaning the buyer’s journey is a framework that acknowledges a buyer’s progression through a decision process ultimately culminating in a purchase. There are a few parts that make up the sales process and every sales trainer or sales system has its own model. But, for our purposes, let’s break down the 3 main parts of the sales process into mindset, language and flow. Mindset: What you believe about yourself, your prospect and your service. Language: What you say, when you say it, and how you say it. Flow: The number of meetings, agenda for each meeting, and order of your follow up. Most sales techniques – like Sandler, SPIN selling, The Challenger Sales, System selling, SNAP selling, N.E.A.T. selling and others – teach tactics, scripts and processes to move the prospect from undecided to a buyer by establishing pain, building credibility and laying groundwork for trust to develop. The reason for most sales techniques or methods is so you can meet a prospect where they are and get them to a place of yes. A prospect arrives as either cold, lukewarm, warm, or hot and your sales process needs to adapt to their “temperature”. I remember going through Sandler sales training and learning to put the different tactics into place within my “sales script” or “first meeting script”. Tactics like upfront contract, post-sell, pain funnel and others. These tactics were statements you made or types of questions asked. Now don’t get me wrong…these techniques worked and I’ve had success using them. But most of the tactics worked with cold or lukewarm prospects who agreed to a meeting. Please note, I’m not trying to oversimplify the sales process and the psychology behind it, but I want to provide a high level overview so you can see the changes or shifts you make with a referred prospect who is hot versus cold or lukewarm prospects. With referred prospects the mindset, language, and flow is different. Now remember, I’m not saying the sales processes, models, and approaches are wrong. But, the same sales advice and techniques will not work when you are working with a referred prospect. Your mindset, language, and flow need to shift so you can better position yourself to turn the referred prospect into a new client. To help you shift how you approach referred prospects, I created this great one page download so you can visualize the process. Grab it here. In any sales situation a prospect – cold, lukewarm, warm or hot – wants to buy and not be sold to. This is even more important with referred prospects. A referred prospect has already identified their problem that needs to be solved. On some level, they trust you to solve their problem because they trust the person who referred them to you (the referral source). And the referred prospect is always yours to lose because of how they were tee’d up for you. They recognize they have a need that can be solved by working with you and they trust you. This is as close to a silver platter as it comes (served up on a silver platter…tell me you got that!). So when dealing with a referred prospect your mindset needs to come from a relaxed place of determining if they are a fit and if you can help. Which means you are not focused on your sales pitch, but have a quiet confidence that comes from only focusing on whether or not you can solve their problems with your service. The referral source believes you can solve the prospect’s problem or they wouldn’t have referred them to you. The prospect believes you can help them because they trust the referral source. So shift your mindset to one of confidence and curiosity instead of concern for making the best “sales” pitch. Remember, when you receive a prospect by referral you are wanted, so act like it. Now that your mindset has shifted, you need to shift your language. When meeting with someone referred to you versus a cold or lukewarm prospect, the biggest shift to make with your language is approaching the meeting with the trust that has been established. With a referred prospect they drop into your buyer’s journey (or sales process) at the end of the “know, like, trust” continuum, the trust side. This continuum is the stages of how someone feels about you before deciding to hire you (and is part of the buyer’s journey). First, they need to know you, then decide if they like you (meaning would be okay working with you) and finally trust you enough to say yes to hiring you. Which means the questions you ask, in all conversations, but in particular the first meeting or call, are positioned for the “trust” side of the continuum. Questions in which you extend the trust they already have for you. Now, don’t take the trust for granted but work from that trust. You should go into your conversation with your referred prospect feeling confident because he or she knows a little about you, knows you can solve their problem, and trusts you since they trust the person who referred them to you. You need to approach the meeting, or phone call, to just have a conversation and leave the sales “dog and pony” show at home. When you focus on just having a conversation a few good things happen. You allow yourself to be more comfortable and building rapport is easier because it is not forced. You focus on asking questions that will help the prospective new client make the right decision for herself on whether or not to hire you and your questions are trust-building questions which removes the feelings of a “sales pitch” from the meeting. Remember people want to buy, not be sold to. Your job is to guide them through the decision process honestly and with a few specific trust-building questions you can. The difference between a first meeting with a referred prospect versus a prospect not referred is your “script” looks entirely different. The beauty of a conversation with a referred prospect is you only need to focus on a few trust-building moments, ask one powerful question and can allow the rest of the meeting to just flow. There are a couple of points to the flow of a sales meeting. The number of meetings is one, meaning most sales processes include an initial meeting (in person or the phone) and then, depending on what you are selling, additional follow up meetings to get to a “yes” may be needed. For example: to hire a bookkeeping firm I may need to meet only once but to hire a financial advisor, we may meet two to three times. Another is how you follow-up after a meeting…email communication, phone communication, sending additional material, etc. The flow of the meeting is important because it will impact your prospect’s decision-making process. With referred prospects you need to shift from a traditional sales meeting flow (or agenda) to a referral-based meeting flow. Here are a few considerations for the flow of your sales process with a referred prospect, especially relevant for the first initial meeting or phone call you have with them where you will discuss working together. Make the connection to remind the prospect he or she was referred. Remember to build on the transferred trust from the referral source. Ask questions to truly understand the prospects’ need. The conversation should focus on making sure you understand what they are looking to solve. It’s as important for them to articulate their need for you as it is for them to articulate their need for themselves. This is how they will decide if they truly want to solve the problem. In my meetings with referred prospects I ask one critical question that allows them to close themselves all while reconnecting them to their need and the person who referred them to me. Expect the prospect to say yes but know he or she may choose to say no. Being confident – without being cocky – is the opposite of the “something to prove” mentality. Leave time for questions so you can make sure all concerns have been processed. Lay out “the work” or “product” clearly so you communicate what it is going to be like to work with you. This is key to establishing a strong client experience. Download the Referral Prospect Meeting Outline so you can still see this as the 7-step framework it is. Use the outline to customize your own meeting flow when you are meeting with referral prospects. Truth is, I believe you should use the key points above for any “sales” situation and I think many sales trainers would agree with me. Of course, the only part that wouldn’t fit in a non-referral prospect is the part about establishing the connection back to the referral source. Finding the right language and flow or rhythm in any prospect situation – referred or not – takes time so I encourage you to test out different language so you can connect better in the first meeting with the referred prospect. And that “solving” mindset during the sales process (the buyer’s journey) allows me to stay in my expert place of being a resource and partner to my clients and not seen as an always hustling salesperson. There is a theme running through the advice in the sections of this article. You see it in why your sales language changes when meeting with referrals. Yep. Not salesy or slimy. Just you being you – focused on the prospect and if you can help them. This process of changing from “sales language” to “referral language” when meeting with a prospect rests on you being your authentic self. It’s not you imitating me, your peers, that guy from your networking group or anyone else. And what allows you to be authentic is the shift in your mindset, language and meeting flow. Everything is completely different when dealing with referrals. You need to approach the conversations you have and the relationships you build by focusing on giving, helping, and connecting. And it is with a referral prospect where most of us find comfort, our sweet spot, and a place where we want to do business. It is in this spot – working from referrals – where we know we are presenting ourselves as the expert we are…the CPA, attorney, realtor, financial advisor, photographer, interior designer, insurance agent, mortgage broker, business coach, bookkeeper, marketing consultant…and not the always hustling salesperson. Because we became business owners to help others. And now we can shift how we “sell” and be confident that focusing on solving over selling will provide the business growth trajectory we deserve. All because we have a different meeting flow to follow when meeting with a referred prospect. I saw you speak yesterday at Acumen. I am interested in hiring you and have a few final questions. I can not figure out for the life of me how to get in touch with you. Please contact me. Thanks! Hi Chris! I’m glad we were able to connect and talk about my Growth By Referrals program!